A major find where a musical instrument has been a key player. Treasure Registrar Ian Richardson has composed a little something to explain why this is literally hidden treasure! Part of the ‘Piano Hoard’ discovered in Shropshire. © Portable Antiquities Scheme/The Trustees of the British Museum. Photo: Peter Reavill. It’s no surprise that a lot of people are excited and intrigued by the discovery of the so-called ‘Piano Hoard’. We grow up with stories of hidden treasures and the brave or lucky people that find them, and it can be appealing to imagine ourselves in their places. The Piano Hoard story has the added excitement that it’s relatively recent – this is not a long-buried assemblage of war booty or grave goods, but a large sum of money hidden in plain sight less than 100 years ago. So what happened to the original owner and why was the hoard hidden in the first place? First, to take a step back, it should be explained that despite its adopted title the Piano Hoard is not a collection of musical instruments(!) but rather a group of 913 gold sovereigns and half-sovereigns found stashed under the keyboard of a Broadwood & Sons upright piano, made in 1906. Martin Backhouse had been asked by the piano’s owners, the Bishop’s Castle Community College, to tune the newly acquired instrument and in the course of doing so he removed the keys and noticed seven cloth-wrapped parcels in spaces which should have been empty. Looking inside one, he noticed the gold coins and immediately informed the school. The school, knowing they hadn’t put the coins there, then in turn contacted HM Coroner for Shropshire, John Ellery, as required by law under the Treasure Act 1996. 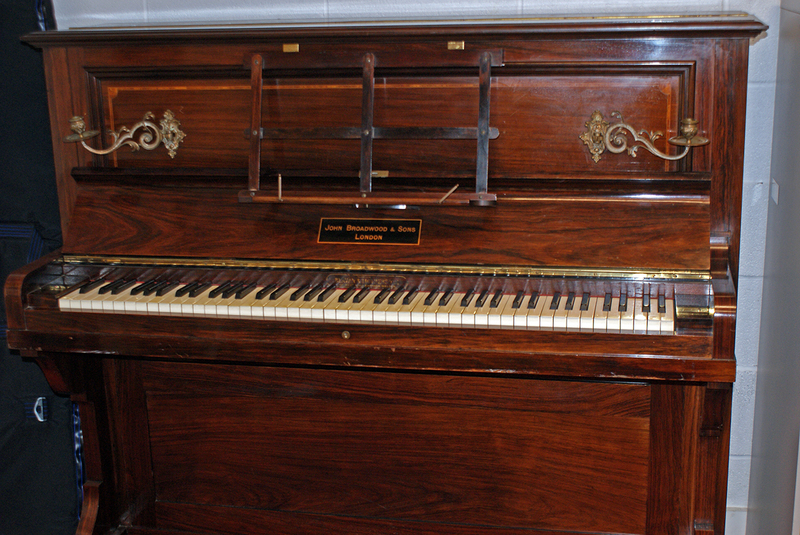 The piano in which the hoard was discovered, donated to the school by Mr and Mrs Hemmings. Photo: Peter Reavill. This sequence of events often perplexes people, who usually associate coroners with investigations into sudden and suspicious deaths (which in truth is a major part of their role). But in England, Wales, and Northern Ireland, coroners also act as the Crown’s representative in cases of potential ‘Treasure’, a legal term defined by the Treasure Act (Scotland has a separate law of Treasure Trove). It is also why you are reading about the Piano Hoard in a British Museum blog. The British Museum acts as the Treasure Registry for all finds of potential Treasure from England, and performs the secretarial work for the Treasure Valuation Committee (TVC), an independent body that recommends values for Treasure finds to the Secretary of State. Furthermore, the British Museum coordinates the Portable Antiquities Scheme (PAS), a network of regional Finds Liaison Officers (FLOs) who record archaeological finds discovered by the public on a free-to-use database. Importantly for this story, FLOs also support coroners in their Treasure work, and the FLO for Shropshire and Herefordshire, Peter Reavill, has been heavily involved in this case. 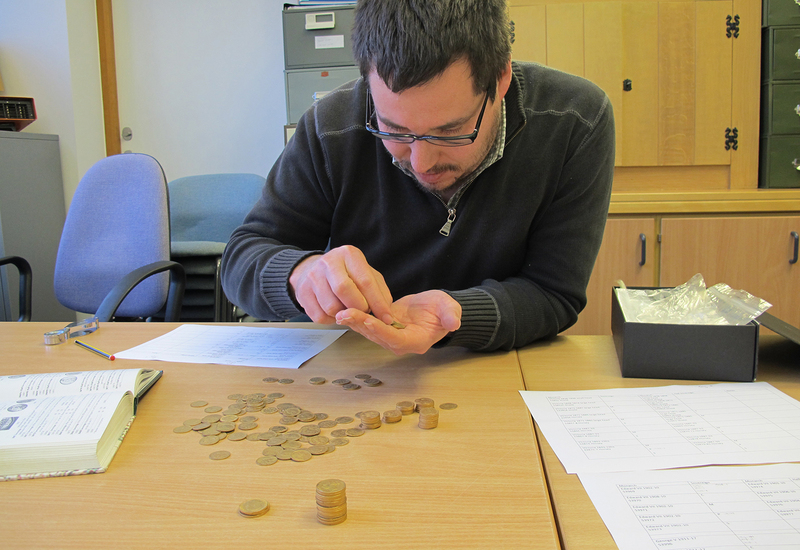 Peter took receipt of the parcels from the school and carefully opened them all, looking for clues about their owner and meticulously cataloguing the coins. Finds Liaison Officer Peter Reavill recording part of the ‘Piano Hoard’. © Portable Antiquities Scheme/The Trustees of the British Museum. Photo: Emily Freeman. The point of the Treasure Act is to ensure that important archaeological finds are reported, allowing everyone to benefit from the knowledge of their discovery, and to allow public collections (museums) the opportunity to acquire them. If a coroner agrees that a find meets the criteria for Treasure, then it belongs to the Crown, who may place it in an appropriate museum, with the finder and landowner being rewarded financially. Most reported Treasure meets the criteria by being more than 300 years old, made of gold or silver, or constitutes a group of coins more than 300 years old or prehistoric base metal. Over 1,000 discoveries of this type are reported and logged by the British Museum every year, and hundreds acquired by museums, enriching our culture and increasing our understanding of the past. Part of the hoard. © Portable Antiquities Scheme/The Trustees of the British Museum. Photo: Peter Reavill. But what about the Piano Hoard? 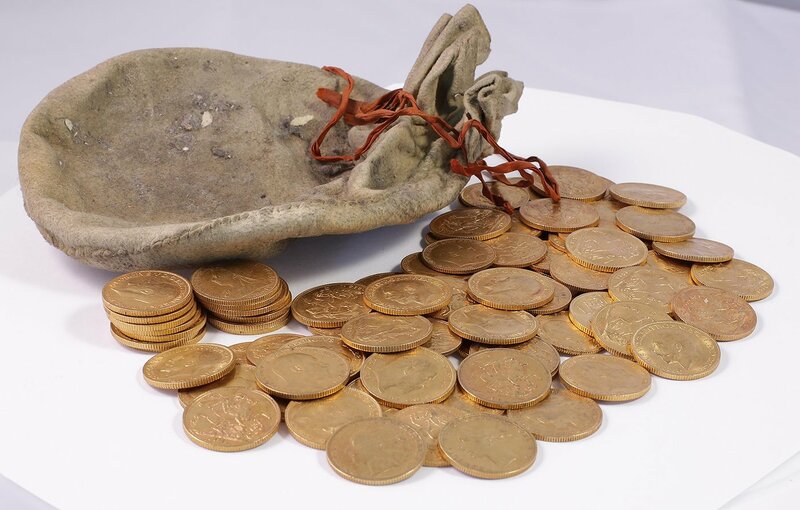 The gold coins found within it date to 1915, so are much less than 300 years old. However, the Treasure Act also stipulates that items of any age, made substantially of gold or silver, whose original owners or heirs are unknown, and which are deemed to have been deliberately hidden with the intention of recovery, are also ‘Treasure’. This was the heart of the matter for the Coroner, who had to determine whether the Piano Hoard fitted all of these criteria. In practice, very few gold and silver items that are less than 300 years old do, because either their owners or heirs are known, or it is impossible to say whether they’d been hidden with the intention of recovery – most Treasure finds are thought to be chance losses. 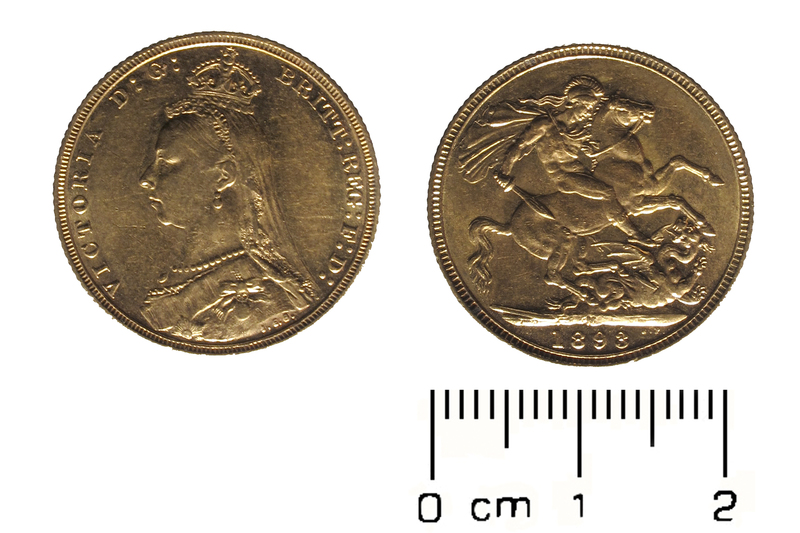 Gold sovereign from the reign of Queen Victoria (1898 – Jubilee Bust of Victoria), from the hoard. © Portable Antiquities Scheme/The Trustees of the British Museum. Photo: Peter Reavill. But central to the Piano Hoard’s story is that it certainly seems to have been put away for safekeeping. The coins are clearly made substantially of gold (the coins are all 91.7% precious metal), so the main concern for the Coroner was to investigate any information about a possible owner of the hoard or their heirs. Peter Reavill investigated leads in the archives of the piano maker, the Essex Record Office and even the Shredded Wheat company (whose packaging was found wrapped around one parcel of coins). He concluded that the coins couldn’t have been hidden earlier than the late 1920s, but nothing identifying the owner of the coins was traced. Working with Peter and the British Museum, the Coroner issued several press releases appealing for more information. Over 40 claimants and others came forward with information but as we now know, none could prove their claim to the Coroner’s satisfaction. As such, the Coroner decided at the inquest on 20 April 2017 that the hoard met the criteria for Treasure. That means that the Piano Hoard is now owned by the Crown, but that ownership is only exercised if a museum wishes to acquire all or part of the hoard. Saffron Walden Museum has expressed an interest in a small element of the hoard, as it would seem that it must have spent most of its life in that town. The British Museum will now organise for the coins to be valued, first by an independent expert from the trade and then by the Treasure Valuation Committee. Saffron Walden Museum will have to pay that value to acquire the coins, with the money going to Mr Backhouse and the community college as a reward, should they wish to claim it (some rewards are waived by the finders and owners). The rest of the coins will be returned to them to do with what they will. Despite the fact that the heirs of the original owner of the coins haven’t been identified, the Piano Hoard tells an intriguing story. Collections of gold and silver coins from the 19th and 20th centuries are not terribly unusual discoveries, and as recently as 2011 a hoard of gold sovereigns was found in a field in Twinstead, Essex. But that hoard consisted of just over 200 coins and indeed most others seem to be of similar or smaller amounts. The Piano Hoard might be the largest hoard of its type found to date. It appears to have been collected over several decades and then kept safe after Britain first went off the gold standard in 1914, but it was only tucked away in the piano in the late 1920s at the earliest. Could this have been a reaction to the Depression, or events leading up to the Second World War, or to that conflict itself? What happened to the person who amassed this considerable wealth? Part of why this discovery strikes a chord with the public is that we may never know the definite answer to these questions, and we are free to wonder. Find out more about the Portable Antiquities Scheme and the Treasure Act.